Online Registration Ends – Friday, October 26, 2018 has been EXTENDED to 9:00 PM. 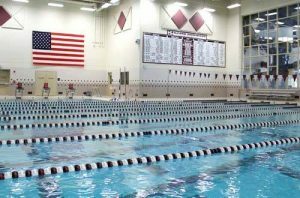 Location: Milford High School Natatorium | 2380 South Milford Rd | Highland, MI 48357 Milford High School is 1.5 miles south of M-59, enter on Watkins Blvd. Pool entrance is located on north end of school by the football field. Short Course Meters / 6 Lane Pool. Warm Up & Cool Down Area and Electronic Timing. There is plenty of parking and seating for spectators. Locker rooms are available. Huron Valley is not responsible for lost or stolen items so please bring a lock. This meet will be swum as Short Course Meters (SCM). The length of the competition course without a bulkhead is in compliance and on file with USMS in accordance with articles 105.1.7 and 107.2.1. The primary timing system will be automated with sound device at the start and swimmer touching the pad at the finish with the time recorded on a scoreboard. Official times from this automated timing system will be submitted for USMS Records and USMS Top Ten times for all courses. For Short/Long Course Meters the time will be submitted to FINA for Masters FINA Top Ten and Masters FINA World Records. Entries: On-Line Registration: $27. Register Online at: www.michiganmasters.com. Online registration closes Friday, 10/26/18, at 12:00 Noon. Mail-In Registration: $27. Mail-In registration forms must be postmarked by Monday 10/22/18, and Mailed to: Jim Izzi, 1951 S. Milford Rd., Highland, MI 48357. 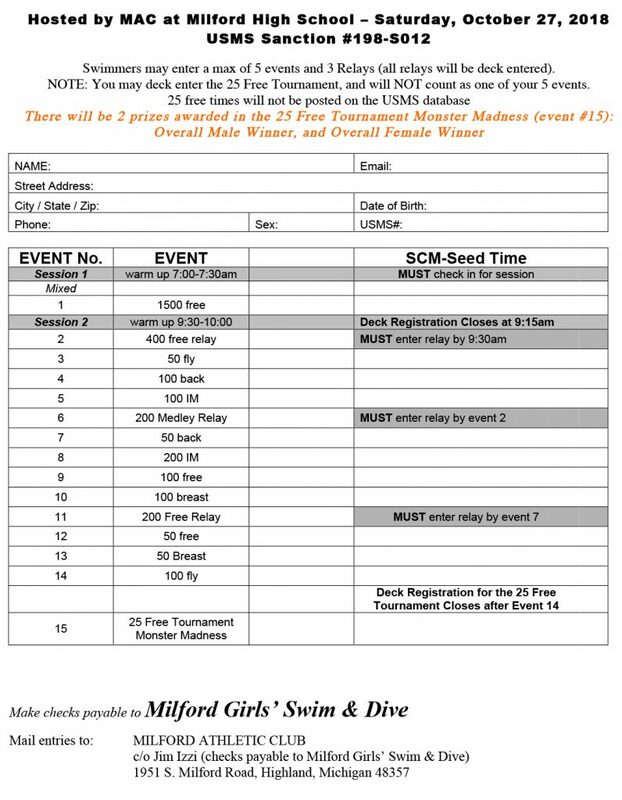 Swimmers may enter a max of 5 events and 3 Relays (all relays will be deck entered). NOTE: You may deck enter the 25 Free Tournament, and will NOT count as one of your 5 events. 25 free times will not be posted on the USMS database. Mail photocopy of current USMS card with entry. FINA rules apply to SCM Meets. Your age on 12/31/2018 determines your age group. Session I Starts 7:30 am and will consist only of the first 18 entries received for the 1500 Free. We will contact you if you’re not in the 1500. If not at max and you are coming early, we will allow deck entries on a first come basis. Hospitality: Snacks available during the meet.